Licorice root has been used for centuries—from the Ancient Egyptians (to whom it was a panacea for all that ailed), Brahmans of India, the Greeks, Romans, Babylonians and the Chinese. Armies all over the ancient world carried licorice root with them on long journeys to sustain, nourish, and fight infection—not to mention the sweet, pleasant taste of the root. Dioscorides, the ancient Greek physician, named licorice root for its sweet taste: glukos for “sweet” and riza for “root”. Early settlers introduced the root to the NewWorld, showing the Native Americans here that it can be effective for treating colds and digestive disorders alike. Most exported licorice root today is produced in Greece, Turkey and parts of Asia. Historically, licorice has been known for its demulcent, anti-microbial and expectorant qualities. Licorice is soothing to inflamed mucous membranes, thus it can be used to treat sore throats. It is also used in several herbal cough and cold formulas as well, as it tends to loosen mucus in the lungs. In current research and complementary medicine, licorice is used for alleviating the pain of peptic ulcers, especially since its anti-microbial properties are thought to have an affinity forH. pylori bacteria. Preliminary research suggests that licorice blocks the metabolism of certain inflammatory prostaglandins (E and F2 alpha) which may explain why many people feel relief of peptic ulcer symptoms. In human and animal studies licorice has been seen to reduce the incidence of gastric bleeding and ulcers when taken in conjunction with aspirin (which poses a risk for these undesirables). Iberogast, a commercially available herbal product containing licorice, has been shown to be effective in treating ulcers. Other research has been mixed, although a long history of use still speaks to its effectiveness for many people. In addition, licorice can act as a mild laxative, and has anti-inflammatory, anti-viral anti-oxidative, immune-modulatory, hepato-protective and cardioprotective properties as well. The active component of licorice, glycyrrhiza, is responsible for its sweet taste that is roughly 50 times sweeter than sugar when isolated (this explains why licorice became popular as a treat!). Glycyrrhizinates participate in the cortisol activation pathway, inhibiting the enzyme responsible for activating cortisol (11- dehydroxysteriod Dehydrogenase) as well as the output of adrenal corticotrophic hormone (hence its effect on the kidneys and adrenal glands, as well as the risk of mineral corticoid excess when consumed in high doses for long periods of time). There are some serious side effects associated with increased consumption of glycyrrhizin—fortunately, the risk of side effects are somewhat diminished when licorice root is consumed in the “whole plant” form because the bioavailability of glycyrrhizin is reduced. In addition to altering cortisol, some studies have noted decreased plasma testosterone levels in healthy women although the results are mixed for men. Another form of licorice, deglycyrrhizinated licorice (DGL) is available, and it is this form that is often used in clinical studies (again, to reduce the risk of side effects in populations that are already at higher risk for adverse events). Topically, licorice is also used as a hair rinse to reduce sebum secretion and shows promise in pigment-reducing formulas. Glycyrrhetinic acid and glycyrrhizic acid is often used in many cosmetics and skin creams. There is mixed evidence for licorice’s effect on weight loss. Some studies have found that regular consumption of licorice can reduce fat mass, but at the same time, it encourages salt and water retention which may offset the weight loss. A tea can be made by pouring 8 oz of boiling water over 1 tsp of dried licorice root. This should be allowed to steep at least 5 minutes. A decoction can also be made by boiling the same amount of herb, and then simmering for 5 -15 minutes. This can be consumed 1-3 times daily. If using for more than a week at a time, consult a health care professional familiar with botanical medicine. Licorice root can be consumed safely by most people (see contraindications below) for up to four to six weeks, although safety of long term use has not been established. LICORICE IS GENERALLY RECOGNIZED AS SAFE AND SAFE TO USE FOR SHORT PERIODS OF TIME. 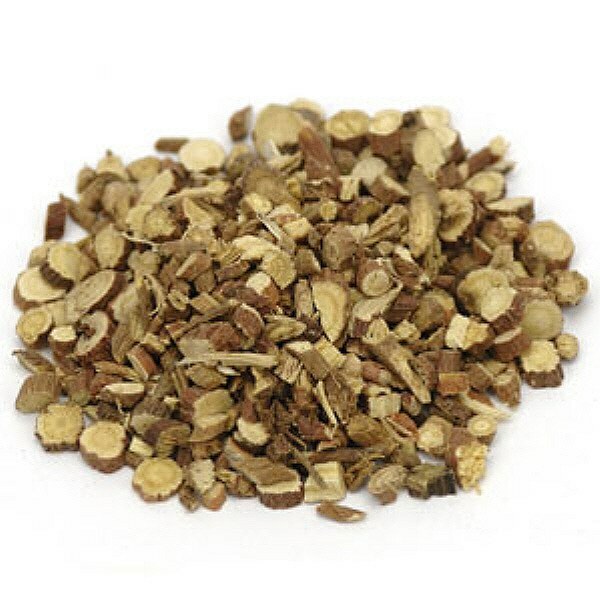 AVOID LICORICE ROOT IF YOU ARE TAKING WARFARIN, AND SEEK MEDICAL ADVICE IF YOU ARE TAKING CORTICOSTEROIDS, BLOOD PRESSURE MEDICATION (ANTIHYPERTENSIVES) DIGOXIN, DIURETICS AND CYTOCHROME P450 2B9, 2C9 OR 3A4 SUBSTRATES (KETAMINE, TAMOXIFEN, IBUPROFEN, LOVASTATIN ETC). LICORCE ROOT IS KNOWN TO ALTER ION LEVELS IN THE BODY AND MAY RESULT IN PSEUDOHYPERALDOSTERONISM (MINERALCORTICOID EXCESS), SODIUM AND WATER RETENTION, URINARY POTASSIUM LOSS, ALKALOSIS AND HYPOKALEMIA. THIS MAY POSSIBLY LEAD TO HYPERTENSION, EDEMA, ARRHYTHMIAS, HEADACHE, MUSCLE WEAKNESS, LETHARGY AND ALTERED RENAL FUNCTIONING ETC. AS WELL AS POTENTIALLY ALTERED EKG READINGS. THESE EFFECTS ARE MORE LIKELY TO OCCUR IN INDIVIDUALS WITH PREEXISTING HYPERTENSIVE, HEART OR KIDNEY CONDITIONS OR IN THOSE TAKING HIGH DOSES FOR AN EXTENDED PERIOD OF TIME. LICORICE ROOT HAS A LONG HALF-LIFE AND THUS ITS EFFECTS MAY LAST UP TO TWO WEEKS AFTER A PERIOD OF PROLONGED DAILY USE. ACUTE SIDE EFFECTS OF HYPOKALEMIA TYPICALLY APPEAR IN TWO TO THREE WEEKS AND BLOOD PRESSURE MAY TAKE UP TO SEVERAL MONTHS TO NORMALIZE ONCE USE IS DISCONTINUED. PREGNANT WOMEN SHOULD AVOID USING LICORICE ROOT AS IT CAN ACT AS A UTERINE STIMULANT AND ABORTIFACIENT. LICORICE ROOT ALSO DECREASES SERUM TESTOSTERONE LEVELS AND THUS CAUSE LOW LIBIDO AND SEXUAL DYSFUNCTION IN MEN WITH LOW TESTOSTERONE. LICORICE ROOT SHOULD ONLY BE USED FOR SHORT PERIODS OF TIME AND IT IS ADVISED THAT PATIENTS TAKE DRUG “HOLIDAYS’ IF THEY PLAN TO CONTINUE USING LICORICE ROOT FOR LONGER PERIODS OF TIME. “Licorice consumption and serum testosterone in healthy man”. Armanini D, Bonanni G, Mattarello MJ, Fiore C, Sartorato P, Palermo M. Exp Clin Endocrinol Diabetes. 2003 Sep;111(6):341-3. “Licorice reduces serum testosterone in healthy women”. Armanini D, Mattarello MJ, Fiore C, Bonanni G, Scaroni C, Sartorato P, Palermo M. Steroids. 2004 Oct-Nov;69(11-12):763-6. “Licorice: The History of Licorice”. Knuteson. Herbal Legacy. “Review of pharmacological effects of Glycyrrhiza sp. and its bioactive compounds”. Asl MN, Hosseinzadeh H. Phytother Res. 2008 Jun;22(6):709-24. [abstract]. “Risk and safety assessment on the consumption of Licorice root (Glycyrrhiza sp. ), its extract and powder as a food ingredient, with emphasis on the pharmacology and toxicology of glycyrrhizin”. Isbrucker RA, Burdock GA. Regul Toxicol Pharmacol. 2006 Dec;46(3):167-92. [abtract]. “The old lady who liked liquorice: hypertension due to chronic intoxication in a memory-impaired patient”. Janse A, van Iersel M, HoefnagelsWH, Olde Rikker MG. Neth J Med 2005;63:149-50.